One of the downsides of financial advice is when a person comes to you and it is too late to help, recently I had a client who was about to give up their home, they couldn’t even afford to pay me for advice, but in hearing their story I thought I could turn them around and told them if it works they can take care of it some other day. The first thing they showed me was a letter (click on it for the big version) which basically said ‘you can’t afford your home, time to give it up’. You’ll notice a big white space to the right of it which makes it less legible, that isn’t what happened when we scanned it up, it went to them like that. So the demand to get out wasn’t even presented in a fully readable format. This couple are in their early 60’s and terrified about losing their home. The issue is really about unsecured debt, something I got on straight away to set about burning with gusto. The legal letters were of the usual standard of threat/demand, but the EBS one struck me as odd. It states that the ‘only courses of action left’ (note: plural) are to voluntary surrender then doesn’t mention any other course of action. It also states how they will pay €250 under the Joan Burton scheme to have a professional outline what this may mean (minus any advice, the accountant in this instance is not meant to offer advice, merely outline outcomes). What is really stated is that there is no course of action, no second choice, no anything, just give back the house. This is a situation where there is equity in the home, and I can’t say I have seen the same thing at the same point with couples when there is no equity in the home. 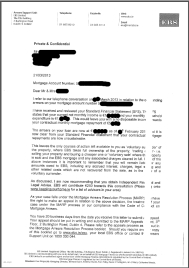 I’m also not satisfied that EBS collections have done their job thoroughly, because I can and will turn this case around for my clients, it starts with burning every creditor minus the mortgage, but the mortgage arrears team in EBS have never suggested this, they merely accepted a Standard Financial Statement and said ‘ok’, clearly you can’t afford this. This only makes me ever more cynical of Irish banks and their efforts to deal with borrowers, this doesn’t look right or seem right to me and if we can turn this around it shows that without third party independent intervention that an elderly couple would have lost their home unnecessarily. This is the real world of bankers. Totally opposite to the bankers that the politicians and central bankers seek to portray. It is sickening to listen to the central bank consumer protection officer on Morning Ireland today talk like the bankers were some benevolent father figures who would look after mortgagors. This parallel universe where bankers are benevolent is exactly opposite to reality as the EBS shows. The proposed new central rules are a bankers charter to screw mortgagors. I have, unfortunately, an EBS Mortgage. I have had 2 six month periods of interest only payments which was to be renewed in January 2013. I submitted by SFS together with vouching doucmentation and to this day, 3 May 2013 I have still not received a decision, despite numerous calls and emails on my part, which presumably means I am the one reneging on my agreement? Why are they hunting down people, sending threatening letters which sometimes offer”courses of action” and then leave you swinging in the wind ?